It was a fortunate accident that saw us at "Twelfth Night" as part of the Donmar's West End Season. When we managed to get tickets for "Hamlet" on the Monday night it just so happened that our trip coincided with a Sunday performance of "Twelfth Night" - and there were still tickets available. And our luck held up as we were rewarded with a simply wonderful piece of theatre - enthralling from start to finish with a pace that never flags. With gorgeous sets and costumes it just screams quality, and most importantly the cast live up to all expectations. 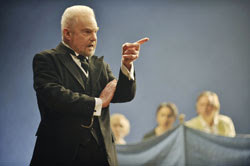 While Derek Jacobi is very much the face of this production, Malvolio is a fairly peripheral character and as a result its heart and soul lie elsewhere. Yes, he delivers some wonderful comedic moments but these are more a series of cameo set pieces than a truly substantial performance. Indeed I suspect in 20 years time I may recall this performance as being the first time I saw Dame Indira Varma on stage, before wondering if that was the one that had Derek Jacobi in it as well. Varma is a joy to watch and even from the very back of the stalls her performance was beautifully expressive without losing any subtlety. Victoria Hamilton also excels and her scenes with Varma and Mark Bonnar's Orsino are played to comic perfection; while Samantha Spiro's Maria is delightfully impish as she orchestrates Malvolio's comeuppance. The male cast members all give sterling performances with Ron Cook's Lord Toby a highlight along with Jacobi, but in truth the ladies have the plaudits sewn up here. Image by Hugo Glendinning used with permission.